It might be the age of the strings. I can tell them apart by the dents. A good member at the talkbass forum miraculously had a couple spares of that knob and sent them to me so it is complete now! hypercarrots wrote: A good member at the talkbass forum miraculously had a couple spares of that knob and sent them to me so it is complete now! Priceless ..... thumbs to the dude who gave you the missing buttons. I have been wanting an active with reverse P pickups. The bass on your profile picture looks great. Hmmm.... anything you could recommend? 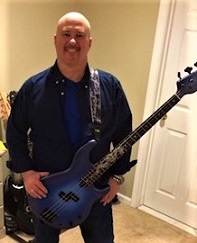 I’m a big fan of the BBs, and my limited experience with Ibanez has not been that great. I’d like to get just the reverse P, no bridge pick up. I was about to buy another BB 300, when I thought to look into if they ever made one with active electronics. And that is a ‘94 BB300 in my profile. Ibanez may have made some older roadstars with a single humbucker and active electronics but I think most of their single pickup models were passive. The older ibanez SR line has reverse pj configuration with 2 to 3 band eq. (Sr800, sr1000 etc). The 2015-17 sr750 and 2015-present sr650 have reverse Nordstrand cnd pj pickups and 3 band active eq. If you’re looking for the reverse p only and active then I gues the bb1200s is an exact match. they are hard to find and have been selling for close to $1000 lately. The peter hook Yamaha signature should be coming out soon. Specs will most likely be single pickup reverse p with 734a electronics and construction. You sure that’s not an 84 BB300? In the later years of BB300 the pickups went regular and were a different type. Years?.... it was my understanding that that version had a very limited run at the very end, the BB300 was discontinued, then the BB 200 replaced it. The BB 300 in my profile was purchased online a couple of years ago, and was listed as a 1994 BB300. I never really questioned it because it had already had the bridge, tuners and knobs replaced, wasn’t very well taken care of, and I originally bought it just to experiment with. And it also had one major difference from the 1984 BB300 I bought in 1984, the entire body was about a quarter of an inch thinner. So if the one that is now blue in my profile picture is older than 1994, do you know around what year they changed the body thickness? Thank you for the info, I’ll give them another look. When you posted a picture of Peter Hook’s new custom BB on Talkbass, I was thinking, “OK, that’s a new version I could get into“. Do you have any information on release dates or pricing? There were a number of running changes in the BB300 line over the years that I haven’t been able to pinpoint to a certain date. I need a larger sampling of serial numbers before I can make any claims. 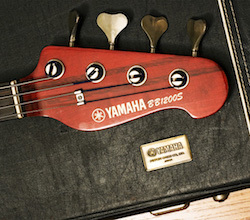 Body shape: lower cutaway was increased somewhere around 1984 or early 85 and the control knobs were slightly repositioned as well. Older shape had the volume knob closer than the tone knob to the strings, newer shape had the volume knob farther awaythan the tone knob from the strings. The control cavity cover on the back changed position in accord but the shape remained the same. Not sure if this also included the body thinning you noticed but I did have a bb450 with a different depth neck pocket which I documented on talkbass. Body shape: seems to have slightly changed again. Still a larger lower cutaway. Knobs are now positioned parallel to strings. Pickups: old BB300 is reversed p configuration and has a ridge in the plastic covers parallel to the pole pieces. New BB300 is regular p configuration and the mounting screws are in a parallelogram shape on the ends of the pickup covers. They are sometimes called ears. Bridge: changed from fender style 5 screw mount bridge (Same mounting pattern so it is interchangeable with vintage fender style bridges) to a 4 screw mount style with larger mass saddles. Headstock shape: hard to describe but later ones had a slightly thinner headstock height. It’s very subtle.